A recent report published by Infinium Global Research on power generator rental market provides an in-depth analysis of segments and sub-segments in global as well as regional power generator rental market. The study also highlights the impact of drivers, restraints and macro indicators on the global and regional power generator rental market over the short term as well as long term. The report is a comprehensive presentation of trends, forecast and dollar values of global power generator rental market. According to the report the global power generator rental market is projected to grow at a CAGR of 6.1% over the forecast period of 2018-2024. A power generator rental is a service that rents the power generators for a shorter period of time. These power generators are used for both industrial and commercial applications. The power rental provides reliable power solution anytime and anywhere in the world whether the job requires prime, backup or standby/peaking power. Mobile power systems services are one of the popular types of power generators rental equipment’s that meet any short- or long-term need. The rental power generators offer various benefits such as Less Maintenance, cost-effectiveness, Flexibility, Field Services, and many others. The rapidly growing demand for electricity and increased power outages are the primary factors that drive the growth of the power generator rental market. The companies working in the power generator rental are offered appropriate warranty and insurance coverage to ensure the service in the malfunction or emergency situations that are contributing to the growth of the power generator rental market. Furthermore, the rental power generators are severed many industries including entertainment, productions houses, IT industry, BPO, Malls, Multiplexes, and other industries. The massive use of rental power generators in the entertainment and political events are creating a positive impact on the growth of the power rental market. Moreover, the leading power generator rental companies are providing better quality and efficient services that further increased the consumer’s inclination towards the rental power generators that are projected to create the various opportunities in the of power generator rental market over the forecast period. Among the geographies, Asia Pacific is the largest and fastest growing region in the power generator rental market. In the Asia Pacific region, the power generated from the existing system is not able to fulfill the power demand. 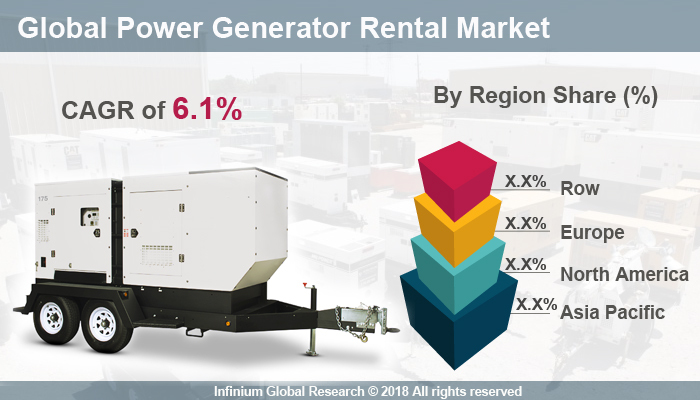 The rapidly growing power demand, industrialization and rapidly growing political & entertainment events in the Asia Pacific region are the factors that are responsible for the substantial growth of power generator rental market in this region. The report on global power generator rental market covers segments such as generator rating, fuel type, and end users. On the basis of generator rating the global power generator rental market is categorized into up to 100 kVA, 101- 500 kVA, and 501- 1000 kVA and above 1000 kVA. On the basis of fuel type, the global power generator rental market is categorized into diesel and natural gas. On the basis of end users, the global power generator rental market is categorized into utilities, mining, oil & gas, events, and construction. The report provides profiles of the companies in the global power generator rental market such as APR Energy, Atlas Copco AB, Cummins Inc, Reddy Generators, Sunbelt, China Engineers Limited, United Rentals, Inc., Caterpillar Inc., and Aggreko PLC. The report provides deep insights on demand forecasts, market trends, and micro and macro indicators. In addition, this report provides insights into the factors that are driving and restraining the global power generator rental market. Moreover, IGR-Growth Matrix analysis given in the report brings insight into the investment areas that existing or new market players can consider. The report provides insights into the market using analytical tools such as Porter's five forces analysis and DRO analysis of power generator rental market. Moreover, the study highlights current market trends and provides forecast from 2018-2024. We also have highlighted future trends in the power generator rental market that will impact the demand during the forecast period. Moreover, the competitive analysis given in each regional market brings insight into the market share of the leading players. This report will help manufacturers, suppliers, and distributors of the power generator rental market to understand the present and future trends in this market and formulate their strategies accordingly.